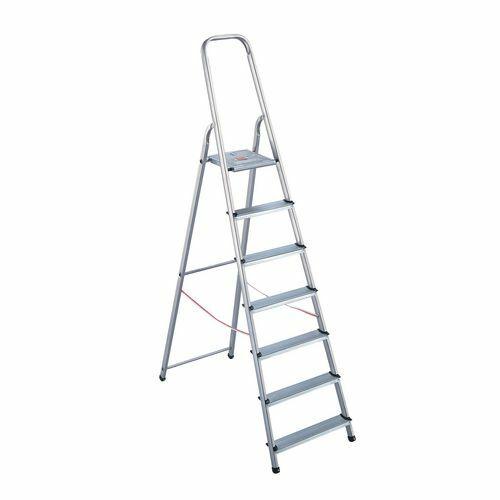 Ladders with platforms are useful pieces of equipment to have at work or around the house. They give you a steady place to stand while you are performing a task at height, allowing you to work more comfortably, making you feel more secure and balanced. These heavy duty platform steps from Slingsby have a light-weight aluminium and steel construction, making them strong and easy to move. The large serrated platform and wide slip resistant treads give under foot grip for the user, increasing their safety. Slip-resistant feet add extra security to the ladder and they have a 600mm safety rail providing somewhere to grip on to while using the platform, helping the user feel more at ease while at the highest point. Manufactured to EN131 for trade use and to GS standards, they have a maximum permissible load of 150kg. Available in a choice of 6 platform heights; 570, 770, 980, 1190, 1450 and 1620mm, our aluminium heavy duty platform steps are easy to store at only 12cm deep when closed and they have a 36 month guarantee.